NATIONAL BOOK CRITICS CIRCLE AWARD WINNER NAMED ONE OF THE BEST BOOKS OF THE YEAR BY "THE SEATTLE TIMES"
This groundbreaking dual biography brings to life a pioneering English feminist and the daughter she never knew. Mary Wollstonecraft and Mary Shelley have each been the subject of numerous biographies, yet no one has ever examined their lives in one book until now. 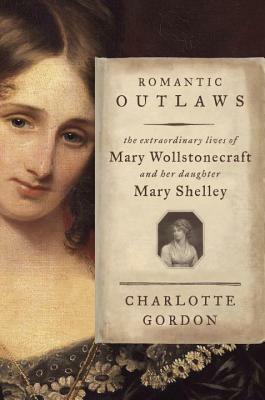 In "Romantic Outlaws, "Charlotte Gordon reunites the trailblazing author who wrote "A Vindication of the Rights of Woman" and the Romantic visionary who gave the world "Frankenstein" two courageous women who should have shared their lives, but instead shared a powerful literary and feminist legacy. In 1797, less than two weeks after giving birth to her second daughter, Mary Wollstonecraft died, and a remarkable life spent pushing against the boundaries of society's expectations for women came to an end. But another was just beginning. Wollstonecraft's daughter Mary was to follow a similarly audacious path. Both women had passionate relationships with several men, bore children out of wedlock, and chose to live in exile outside their native country. Each in her own time fought against the injustices women faced and wrote books that changed literary history. Brave, passionate, and visionary, they broke almost every rule there was to break, Gordon writes of Wollstonecraft and Shelley. A truly revelatory biography, "Romantic Outlaws" reveals the defiant, creative lives of this daring mother-daughter pair who refused to be confined by the rigid conventions of their era. An] impassioned dual biography . . . Gordon, alternating between the two chapter by chapter, binds their lives into a fascinating whole. She shows, in vivid detail, how mother influenced daughter, and how the daughter's struggles mirrored the mother's. "The Boston Globe"
Written with the galloping pace of a skilled novel peopled with fascinating characters . . . these women live on in its pages. . . . Thorough and irresistible. " The Seattle Times"
Gordon unfolds the two stories in tandem, deftly balancing the gossipy aspects of her subjects lives with their serious intellectual concerns. "The New Yorker"
A most welcome deeper take on the women who scandalized Victorian England and whose stories continue to resonate today. "Vogue"
By linking these two lives, Ms. Gordon's biography stretches over a fascinating era in history, characterized by great flux in political and cultural thinking and involving some of the main figures in English literary and philosophical history. " The Wall Street Journal. Charlotte Gordon is the author of "Mistress Bradstreet: The Untold Life of America s First Poet "and" The Woman Who Named God: Abraham s Dilemma and the Birth of Three Faiths." She has also published two books of poetry, "When the Grateful Dead Came to St. Louis "and" Two Girls on a Raft." She is an associate professor of English at Endicott College and lives in Gloucester, Massachusetts."